Behind the Scenes in World War 2 - Vol 2. News & Information films seen only by U.S. Army, Navy & Air Force personnel! Behind the Scenes in World War 2 - Vol 2. NEW! U.S. Army, Navy & Air Force personnel only! Behind the Scenes in World War 2 - Vol 2. News & Information films seen only by U.S. Army, Navy & Air Force personnel! G. B. Shaw said, "The United States and Great Britain are two countries separated by a common language." That was never more true than when tens of thousands of American servicemen poured into the British Isles during World War 2. This charming, humorous film, starring award winner Burgess Meredith, was an Anglo-American co-production shown to prepare Yanks for successfully dealing with inevitable culture shock when they started moving among the general population in the U.K., and just as importantly, how to avoid unintentionally offending their hosts. Parts of surviving copies of this film have darkened with age to become virtually unwatchable. I was able to digitally restore them. There are lots of useful tips on language, customs, geography, currency, travel, pubs and how gregarious & outspoken Yanks could lean to live with "British reserve." Times were very tough in wartime Britain, with shortages of just about everything. G.I.s were cautioned not to flaunt their relative prosperity, an issue that caused real resentment at the time. Last, but not least, there's an entertaining Bob Hope cameo. After all, he was born in the U.K.! * North American A-36 operations in Northern Italy in June-July 1944.The A-36 was the dive bomber variant of the P-51 Mustang. Gun camera footage of air to ground attacks using machine guns, canon and bombs of truck convoys, rail transport, bridges and targets of opportunity near Rome, Sezze, Castellana, Velletri & Bologna. *Bombing missions by B-25 Mitchells in Northern Italy in May 1944 on targets near Pavia and ships and harbor installations in Genoa. * B-24 Liberator missions over Yugoslavia, often accompanied by P-38 Lightnings. Several raids are shown, including a massive 290 aircraft attack on German troop concentrations, logistics & transportation near Banja Luka. * 6th AAF Combat cameramen accompany a deep penetration jungle patrol on Manua Island in the Admiralties in the South West Pacific to gather intelligence and take prisoners for interrogation. The cameramen were armed as firefights with Japanese troops were frequent and every man was needed. They hacked through dense forests and traveled remote rivers in dugouts piloted by indigenous tribesman. * 10th AAF Cameramen show how oxygen canisters from fighters and bombers were put on wheels and used for emergency medical support so wounded aircrew could receive oxygen from the moment they were carried off a plane. "Good old American ingenuity at work!" * 3rd AAF Cameramen cover a wide variety of tactical & strategic B-24 missions in France in May June 1944, including Mulhouse, Belfort, Epinal & Cannes. A-20 Havocs make low level attacks near Cherbourg. 8th Air force make numerous air to ground attacks in Normandy on June 6th to support D-day landings. * 8th Air Force air to air gun camera film, featuring high deflection shots against rapidly maneuvering Fw-190s. * "I Was There" Two veterans of Jimmy Doolittle's B-25 raid on Tokyo discuss it soon after returning to the States, accompanied by film showing actual operations off the Hornet. General "Hap' Arnold condemns Japanese executions of captured pilots & urges servicemen to 'finish the mission against Japanese Warlords." * I Was There" Bombardier & Navy Cross recipient Meyer Leven describes being shot down on the famous mission with the immortal Colin Kelly in one of the first offensive B-17 air operations in World War 2, three days after Pearl Harbor. Kelly died saving his crew. Levin flew 60 more missions with distinction before he was killed in action. The narrator intones blandly, "This is the last time you'll see Meyer, because he's dead now." Wartime bluntness. * Somewhere in America Chinese Cadets are trained as pilots in the U.S.A. before returning to their homeland to fight the Japanese. * Italy to a G.I.. Patrick MacDonald, an Infantry private who was wounded and invalided home, reports on his first person experience serving & fighting in Italy with a wry Irish sense of humor. "There's a lot of SNAFU in the infantry..." He supplies an G.I. 's perspective from embarkation on troop transports in Sicily to landing under fire on the beaches at Salerno, hunkering down, and then moving on to Naples. Excellent supplementary footage air & sea operations. * WASPS. The Women's Air Force Service Pilots (WASP) was a civilian women pilots' organization, whose members were federal employees, served as ferry pilots, transferring all kinds of military aircraft all over the World. This freed up men pilots for front line service. 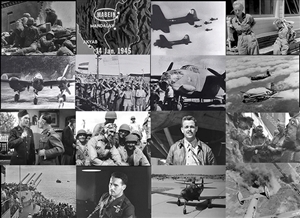 See all aspects of their training & induction by WASP founder Jacqueline "Jackie" Cochran. * I Was There: Tarawa. Marine Corps Staff Sargent Norman Hatch went in with the first wave of the landings at Tarawa, "armed with a pistol and hand camera." He gives a dramatic first person account of the battle for the island fortress that bristled with heavy guns and deeply entrenched defenders. Scenes from landing on the beeches through the final defeat of the Japanese garrison, illustrated with footage he filmed himself. * U.S. Marine Corps General Vandegrift Talks about Guadalcanal. Gen Vandegrift commanded the 1st Marine Division to victory in its first ground offensive of World War II, the Battle of Guadalcanal. (He was also in command of all ground operations.) For his service during the Solomon Islands campaign, he received a Medal of Honor. He gives his unique insights into the course of the battle, supplemented by excellent footage of air sea & ground combat operations including jungle fighting and air ops out of Henderson Field. * Going Home: Free French Pilots Fly Missions over France. This film follows an group of Free French pilots from flight training school in Florida to bases in Britain where they flew A-20 "Boston" missions over France. Exciting footage of A-20s "hedge hopping" on very low level bombing raids on German held targets in occupied France. A gut wrenching experience for French pilots bombing their own country where some civilians were inevitably killed. * June 6th 1944. This is a sweeping overall view of the invasion in Normandy made to be shown to armed service personnel world wide, with an introduction by Army Deputy Chief of Staff Joseph T McNarney and a dramatic narration by Eugene Kern, who also narrated portions of "Thunderbolt!" and "Memphis Belle." Covers air sea & ground operations, including footage you won't see anywhere else. *Surrender in the Pacific. The official surrender of The Empire of Japan on board the Battleship Missouri to General MacArthur is the well known center piece of the this report, but most of the action in this fascinating film focuses on what happened shortly before and then after that event. You'll see the first landings and reception of U.S. forces in Japan, the terrible destruction that was wrought there, the surrender of Japanese commands throughout the Far East and the liberation of Allied prisoners who survived barbarous captivity.